Different individuals emphasized either Christ's divinity or his humanity, just as they had done before. Those who emphasized his divinity tended to ignore his humanity: the theological School of Alexandria. Those who emphasized his humanity did not deny his divinity, they simply made a distinction between divinity and humanity: the School of Antioch. Theologians of the School of Alexandria argued that one could not distinguish clearly between Christ's humanity and divinity because a) Christ was fully divine [council of Nicaea] and b) divinity was infinite and could not be limited and human in any way. After the early School of Antioch came into decline, the presbyter Diodore of Tarsus re-founded it in the middle of the fourth century as a semi-monastic community. Nestorius (386 – 451) became bishop of Constantinople in 428. He came from the Antioch school and was taught theology there by Theodore of Mopsuestia. He opposed a relatively new theological and devotional slogan Theotokos - affirming that Mary was the "God-bearer" or "Mother of God." Nestorius was concerned with the thought that God might be seen to have had a new beginning of some kind, or that he suffered or died. None of these things could happen to the infinite God. Therefore, instead of a God-man, he taught that there was the Logos and the "man who was assumed." He favored the term "Christ-bearer" (Christotokos) as a summary of Mary's role, or perhaps that she should be called both "God-bearer" and "Man-bearer" to emphasize Christ's dual natures. He was accused of teaching a double personality of Christ. Two natures, and two persons. He denied the charge, but the term Nestorianism has always been linked with such a teaching. Theodore of Mopsuestia (350 – 428)...the inspiration for Theodore's principles of exegesis may be derived from the School of Antioch, which insisted on the literal and historical sense of the text, as opposed to the allegorical approach advocated by the school of Alexandria. Theodore, in his theological considerations, insists on the human soul of Christ and on the significance of His free moral activity in the work of redemption. 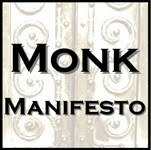 He replaces the phrase "Word and flesh" with the formula "Word and assumed man." Consonant with the Dyophysite position expressed by Diodore and later espoused by Nestorius and the bishops of the schools of Edessa and Nisibis, Theodore also asserts that the two natures of Jesus constitute "one Son" and "one Lord" because they are united in one person. Diodorus of Tarsus (??? - 392) rejected the allegorical interpretation of the Alexandrians, and adhered to the literal sense. In this he was followed by his disciple Theodore of Mopsuestia, and by Chrysostom in his unequalled expositions. The Antiochene School of which he was the leader was discredited by the subsequent heresies of Nestorius, of whom his disciple Theodore of Mopsuestia was the precursor. The Christological question which formed the background to the Nestorian controversy: "How are divinity and humanity joined together and related to each other in Jesus Christ?" The Western Church affirmed Tertullian's formula: in Christ, there are two natures united in one person. The Eastern Church had two schools of thought: the Antiochene and the Alexandrian. The Antiochene school was influenced by Aristotle and adhered to an historical exegesis (i.e. concentrating on what the Bible actually said), affirming that Jesus was fully human, that the Godhead dwelt in him, but did not eclipse his humanity. The Alexandrine school was influenced by Plato and followed an allegorical tradition (i.e. tending to attach several layers of meaning to every text), affirming that Jesus' divinity must take precedence, even if at the expense of his humanity. The Antiochenes spoke of two natures in Christ, so they came to be known as Dyophysites (from the Greek duo physis, "two natures"), whereas the Alexandrians insisted upon one nature, at once divine and human, so they came to be known as Monophysites (from mono physis, "one nature"). In order to preserve the emphasis on oneness, it was difficult for the Alexandrians not to weaken either the deity or the humanity of Christ; in the view of Antioch, they tended to do the latter. Antioch considered that Alexandria devalued the humanity of Jesus, whereas Alexandria looked upon Antioch as overemphasizing his humanity. Founded in about 180 CE by Pantaenus (a former Stoic philosopher), the theological School of Alexandria in Egypt was the first-known organized Christian institution of higher learning. It became a leading center of the allegorical method of Scripture interpretation, which was the same exegetical method practiced by Palestinian Rabbinical schools. Allegorical exegesis involves, as St. Augustine noted, understanding one passage of Scripture by virtue of example, concept, or another passage. Allegory differs from the parable method in its statement of doctrinal truths rather than practical advice. It also differs from the literal method of Scripture interpretation, in which the surface meaning of a passage is the passageís meaning. An example of allegory in the Bible is that of "the vine," found in Psalm 80:8–16 and Isaiah 5:1–6. Under such leaders as Clement (c. 150–215) and Origen (c. 185–254), the theological school of Alexandria endorsed a reestablishment of relations between Christian faith and Greek culture (including the Platonic philosophical tradition), and attempted to preserve Orthodox Christianity in the face of heterodox theologies during periods of doctrinal transition. The Alexandrians typically found allegory in most every passage of Scripture. Moreover, in their accounts of the person of Christ, they tended to focus almost exclusively on His divinity. Some critics have noted that the Alexandrians, in trying to protect against an overemphasis on the humanity of Christ (which they felt led to such heresies as Nestorianism; see below), they sometimes leaned toward tritheism, into which Origen is said to have drifted. Monophysitism (the view that virtually negates Christ’s humanity by claiming Him to be divine only) is thought to have been an extreme form of Alexandrian Christological thinking. 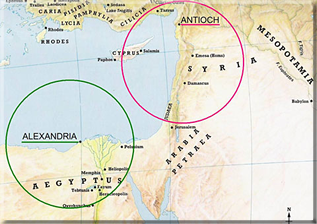 Opposing the School of Alexandria was the School of Antioch, which emphasized the literal interpretation of the Bible. Founded circa 200, the theological school of Antioch in Syria stressed Scriptural literalism and the completeness of Christ’s humanity. Flourishing in the 4th-6th centuries, the School of Antioch gave rise to several significant theologians, including Diodore of Tarsus, Theodore of Mopsuestia, Theodoret of Cyrrhus, and St. John Chrysostom. What is known of the school of Antioch’s founder, the martyr-presbyter Lucian (d. 312), is minimal, with the exception of his having been a keen Biblical student who revised the Greek texts of the Septuagint and the New Testament.Evidently his strictly theological perspectives were heterodox, for Arius and Eusebius of Nicomedia claimed to be his students, even calling themselves "Lucianists." Concerning Arianism, it is important to remember that the Church in the 4th century was dominated by controversy over the propositions of an Alexandrian priest, Arius (c. 250–336), who held that the Son was not eternal but created by God as an instrument for creation of the earth. In other words, Christ, though higher than humanity, was inferior to God, non-eternal, and with a definite beginning. In 325 the Council of Nicaea condemned Arianism and affirmed to Nestorianism, the majority of his exegetical and theological writings were destroyed or lost. Unlike Theodore, St. John Chrysostom was foremost a preacher, aptly earning the title Chrysostomos, or "Golden-Mouthed." The vast majority of Chrysostom’s writings were expositions of the Bible, in which he demonstrated himself to be a rigid proponent of Antiochene literalism. His sermons are reflections of the ecclesiastical, cultural, and social status of Constantinople and Antioch in that day. Not hesitant to denounce and condemn heresy, Chrysostom’s legacy to Orthodoxy is that of an outstanding rhetorician, writer, homilist, and liturgist. The final renowned Antiochene bishop, Theodoret of Cyrrhus (c. 393–458), was also a prolific author. His writings were extensive in range, but the most noteworthy are his Ecclesiastical History, which continued Eusebius’ work to 428, and his Remedy for Greek Maladies, which was a series of ancient apologies against paganism. Theodoret also zealously defended Antiochene Christology against Bishop Cyril of Alexandria’s theology. Cross, F. L. and Livingstone, E. A., editors. The Oxford Dictionary of the Christian Church. Revised edition. New York: Oxford University Press, 1983. Harakas, Stanley S. The Orthodox Church: 455 Questions and Answers. Minneapolis, MN: Light & Life Publishing, 1987. Hurlbut, Jesse L. The Story of the Christian Church. MI: Zondervan, 1970. Latourette, Kenneth S. A History of Christianity. New York : Harper, 1953. Meyendorff, John. Byzantine Theology: Historical Trends and Doctrinal Themes. New York: Fordham University Press, 1979. Walker, Williston. A History of the Christian Church. Revised. New York, Scribner, 1970. Ware, Timothy. The Orthodox Church. New Edition. London: Penguin, 1997.